Launched in June 2001, SILVERTIP is a truly high performance sloop, designed by Dubois and built by Yachting Developments in Auckland. 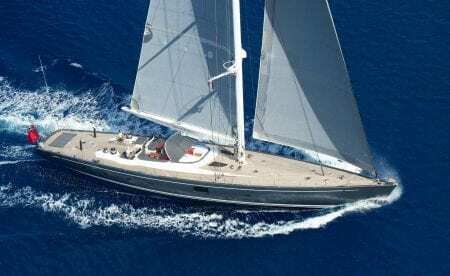 She was the first yacht to ever win both the International Superyacht Society’s Best Sailing Yacht and Showboats’ Best Sailing Yacht awards in her class. She also won the NZ millennium cup 2012, although she was one of the smallest yachts in the fleet, SILVERTIP was clearly the quickest in the light airs. Among the special features of this splendid sloop are the imported Swedish pear wood that lines the magnificent interior, a new AV system, new eC6 rigging and 3Di sails. Her comfortable and spacious cockpit is protected by a generous, folding but semi-permanent sprayhood. This yacht has been in the same ownership from conception, and has been maintained with pride and dedication. SILVERTIP has three luxurious and comfortable cabins aft for a maximum number of 7 guests. There is a beautiful Owner’s cabin, along with one double cabin as well as one twin cabin. SILVERTIP accommodates a crew of 4. Fiji and Vanuatu: June to August 2016. *MYBA Charter Agreements are in use for weekly charters. APA and local taxes apply.